At the tender age of four, Kong Rong had already learnt to share the larger pears with his siblings. 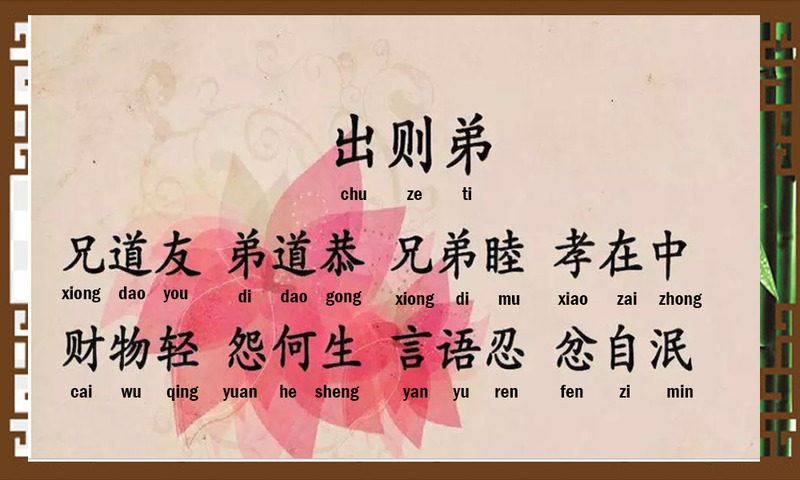 Dizi Gui (Standards for Being a Good Student and Child) is a traditional Chinese textbook for children that teaches children morals and proper etiquette. 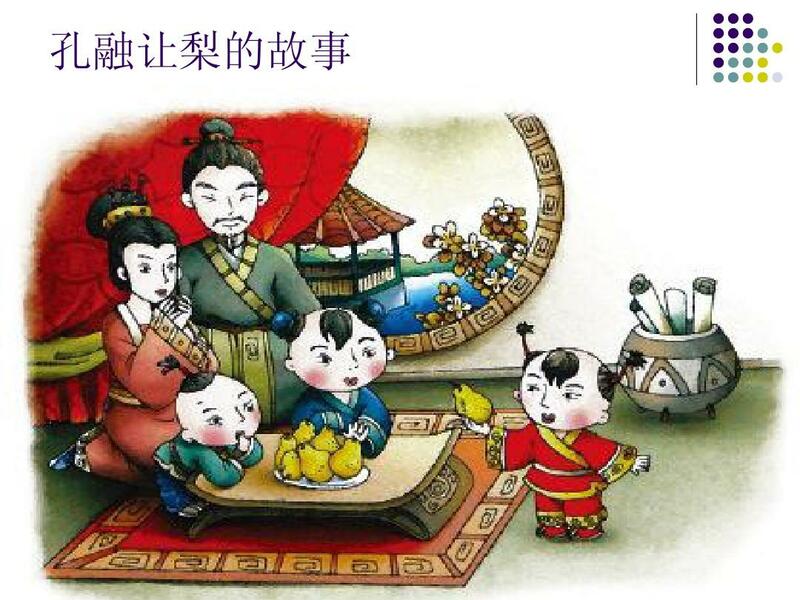 According to Dizi Gui (弟子规), siblings should respect and love each other to maintain harmonious relationships; only then can they be regarded as being dutiful to their parents. When siblings value their ties more than money or objects, resentment will not arise amongst them. When siblings hold back hurtful comments, any feelings of anger will naturally dissipate. A good sibling should always place his elder and younger siblings before himself. A good sibling should always place his elder and younger siblings before himself. 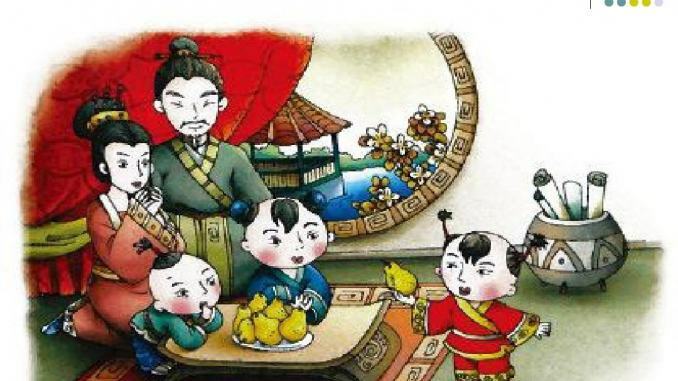 One well-known example is the descendent of Confucius—Kong Rong, who learned to share pears at an early age. Kong Rong (153-208 AD), the 20th generation descendant of Confucius, was a high-ranking official during the reign of Emperor Ling of the Eastern Han Dynasty. As he was once the chancellor of Beihai (present-day Weifang, Shandong), he was also known as Kong Beihai. During his tenure, Kong Rong built cities and schools, and advocated Confucianism. He was also a famed poet and essayist. Kong Rong was known to be good-tempered and hospitable, and his house was always full of guests. Kong Rong upheld etiquette, and as a child he became a household name for his “pear-choosing” story. There were seven brothers in Kong’s family and he was the sixth son. When Kong Rong was four years old, being the youngest child then, he was given first priority in choosing from a basket a pears. However, he chose the smallest pear, leaving the big ones for his elder brothers. Even after his younger brother was born, Kong Rong would give his older and younger brothers the larger pears, leaving the smallest for himself. When asked why, Kong Rong said, “My elder brothers should have the bigger pears because they’re older, but my younger brother should also have the bigger pear as it’s my responsibility to take care of my younger brother.” Kong Rong’s response earned the praise of the Kong family and of those who heard it. This story has been handed down as a much-told story of etiquette and fraternal love, and to this day it remains an essential part of children’s formative education. Li Mian (717-788 AD) was an official and general of the Tang Dynasty, serving as a chancellor during the reign of Emperor Dezong. He was a descendent of Tang’s founding emperor, Emperor Gaozu. Li was poor during his early years, but he did not try to seek ill-gotten wealth. He instead spent his time studying texts, from which he acquired an honest and trustworthy character. One day, Li met a rich scholar who was going to the capital to complete his studies and take the Imperial Exam. The two became very good friends. But the scholar became seriously ill one day, and Li took care of him and treated him just like his own sibling. The scholar eventually succumbed to his illness. Before his death, he begged Li to keep the balance of his gold that remained after paying for his funeral arrangements. Li had no choice but to accept the gift, in order for the scholar pass on in peace. Ultimately, however, Li did not keep a single dime. He secretly hid the gold under the scholar’s coffin, and returned the scholar’s silver to the scholar’s family. During his appointment as JieDuShi in Lingnan, Li didn’t use his power to usurp the fortunes or property of the foreign merchants. He always politely declined any gifts from merchants, and , on his retirement, he even threw all the rhino horns and ivory his family had received into the river. During his two decades of service as an official, Li distributed his salary to his relatives and subordinates, leaving little for himself. As a result, he was found to have no savings when he passed away. Li was honoured greatly and given the posthumous title of Zhen Jian, 贞简, one who “Defends Justice and Exemplifies Modesty and Humility”.